Testo has upgraded the products available. You will find the latest here, with special prices, special kits and free shipping from TruTech Tools! 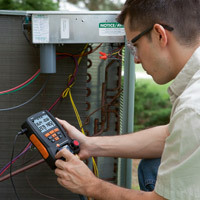 TruTech Tools is proud to announce the introduction of the Testo 550 Refrigeration System Analyzer! The Testo 550 is one of the newest and most innovative products ever manufactured at this price point for Testo. Visit us to place your pre-order for this exciting product. The Testo 550 was engineered to be a perfect balance of features, benefits and value. Features of the 550 include high accuracy pressure transducers, low mass temperature sensors, 3-way manifold configuration and magnifying sight glass. These allow a service technician to easily evaluate both sides of the refrigeration system while displaying pressures, saturation temperatures, superheat and subcooling. All of this is packed into a rugged, compact and affordable package that will fit any technician’s budget. Keeping high quality standards in the forefront, Testo engineers had a daunting task to make the 550 more cost competitive without compromising the quality of the measurement. The outcome was a product that has fewer parts for quicker assembly, a redesign of the temperature sensors to make them more robust (while less expensive) and a more compact design. The 550 has a separate button for almost everything – nine of them to be exact. More keys means eliminating the need to always scroll through multiple menus and sub menus to get to configuration settings. There is a power key for power, and back light key for the display, a setup key for easy configuration, mode keys for different modes, a refrigerant key to select over 31 onboard refrigerant profiles, min/max/mean key for quick system analysis, zero key for the pressure transducers and arrow keys to make selections. The 550 has a brighter and better defined display than previous models. Decimal points and other display characters have been enlarged for easy viewing from a distance. The 550 has 3 brass integrated hose parks that are positional by the user to the back or front of the instrument. Residential technicians that typically set their gauges on the ground can now do so without fear of dirt, moisture or other potential system contaminates picked up by the hose parks entering the refrigeration hoses when they are in the stored position. A relief machined into the end of the hose park allows room for the Schrader depressor and a positive seal that will keep moisture from entering the hoses in the parked position. The hook is integrated into the 550 and designed so it can easily be stored if kept in an instrument case or tool bag. This can be very helpful if you come across foreign equipment that may not have specifications in English units of measure. The 550 can easily be configured to measure pressure and temperature in System International (SI) or the English customary system, eliminating time and error in converting to the desired units of measure. Automatic change of units when the 550 goes into a vacuum allows the technician to easily determine when proper recovery levels are met or to set pressure switches in systems that operate below atmospheric pressure in refrigeration applications. While the 550 is rated for use in vacuum, Testo recommends the use of an auxiliary micron gauge during evacuation. The 550 does read and indicate vacuum, but does not have the resolution to display vacuum in microns. With dual temperature sensor porting standard, the 550 can be used with a second optional probe for charging and troubleshooting without the need to move the temperature sensor. Watching both sides of the system while charging allows the technician to spot problems like a faulty expansion valve at system startup before the system is overcharged. When performing any diagnostic testing, both sides of the system must be evaluated before adjustments to the charge or mechanical repairs are made. The Testo 550 utilizes dual ceramic thick film pressure transducers or pressure-measuring sensors, with a pressure range of -14.7 to 580 psig. Ceramic pressure-measuring cells have a measuring accuracy and repeatability that is stable over a very long time; therefore frequent calibration is not needed. The high and low side sensors are matched and selected for an operating range that will provide the highest accuracy for their desired measuring range, allowing accurate pressure measurement over the full range on either side. The pressure transducers are calibrated in regards to their zero points, coefficient of thermal expansion, and sensitivity so they can be used in wide ranges of temperatures as extra-high precision pressure transducers. Ceramic pressure transducers are designed so the pressure sensitive part is exposed directly to the refrigerant. Thanks to excellent chemical resistance, ceramic pressure transducers do not require additional protection from oils, refrigerants, or acids and additionally will withstand the shocks from normal to rough handling without ever affecting the sensor calibration. While traditional gauges require frequent trips to a calibration house to assure their accuracy (often a procedure never performed), the calibration of the pressure transducers in the Testo 550 is only recommended annually. Like all manufacturers of digital refrigeration gauges, Testo uses a relative pressure transducer that is zeroed to atmospheric pressure. While relative pressure transducers are a very cost-effective solution, they, like bourdon tube gauges, require adjustment when used above sea level. Because the work site atmospheric pressure is typically not the same as pressure at sea level for standard air conditions compensation for barometric pressure needs to be considered for critical charging applications. In the configuration menu, the technician can now input actual barometric pressure in inches of mercury and compensate for pressure measured above sea level or that caused by changing weather conditions. This allows for a technician in an area of the country like California to work as accurately at 7000 ft as at sea level without the need for altitude corrected pressure temperature charts. During initial commissioning or after repair, a standing pressure test is required to verify system tightness over a prescribed time period. The 550 incorporates a timed and temperature compensated pressure drop test that allows the user to see the initial pressure, final pressure and the difference over time. No more marking you gauge position, tapping the gauge and measuring the time with a stop watch. When charging a system, hunting is a common problem during low loads. With the min/max/mean function in the Testo 550, the technician can easily determine what the average superheat is and verify that the system is not intermittently flooding. Pressure switch cutouts both high and low can be verified quickly and easily. The Testo 550 uses NTC thermistors for temperature measurement with a range of -58 to 302°F. The NTC thermistor has several advantages over K type thermocouples including temperature sensitivity, electrical noise immunity, and a lower replacement cost (about 1/4 of the cost). The clamp probe has also gone through an extensive redesign to be easier to use, more robust, and lower cost. With a 1-3/8″ capacity, the standard clamp probe will easily fit around all lines on residential heat pumps and air conditioning equipment. Utilizing low mass electrically shielded thermistors, the 550 clamp probes have excellent response time and temperature measurement characteristics. Using the Delta Temperature mode and a second temperature probe, system components like reversing valves and refrigerant liquid line dryers can easily be evaluated for excessive temperature drops and or leakage which will result in capacity losses and other associated problems. System approach can quickly be determined, by measuring liquid line temperatures and outdoor air to properly charge a system, and temperature across refrigeration coils can be verified to fall within manufacturers’ specifications. Easy to service with basic hand tools, the piston and valve packing assembly are field replaceable. The valve handle can easily be removed by pulling the retaining spring clip with a small screw driver to gain access to the valve assembly. Every unit is leak tested with helium to ensure tightness. By performing this procedure we can insure that the 550 will work in both pressure and vacuum without leaks. The Testo 550 is designed to withstand rigors of day-to-day service and replace the gauges that you now carry. Designed to withstand exposure to POE and mineral oils as well as refrigerant the case will not easily discolor or degrade. Because the keys can be pressed in flush, the unit easily wipes clean with a shop rag. With a rubberized housing, aluminum block and brass valves hose parks and connections the 550 is one of the most durable instruments Testo has developed.